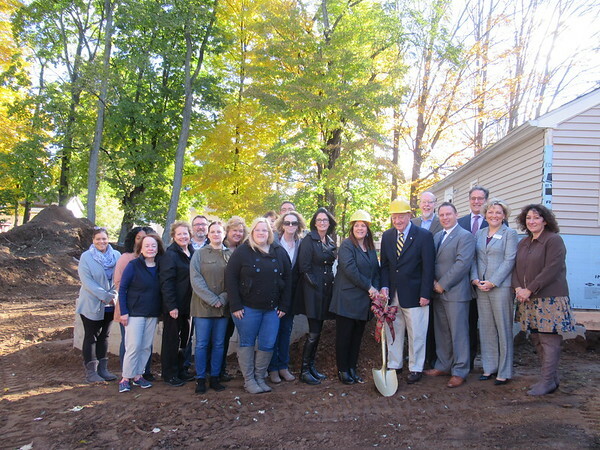 SOUTHINGTON – The ARC of Southington held a groundbreaking Tuesday morning for its new addition, and accepted a $75,000 check from the Main Street Community Foundation to help pay for it. Sandy Amato, ARC executive director, said the donation specifically came from the Bradley H. Barnes and Leila U. Barnes Memorial Trust, administered through the foundation. She credited the town, State Sen. Joe Markley (R-Southington) and State Reps. Rob Sampson (R-Southington) and John Fusco (R-Southington) for their help with the project. If there are any unforeseen expenses at the end of the project, they would have to be covered by fundraising, she added. The 18,000 square foot addition is in the back of the building at 201 West Main St., Plantsville. It will include more office and storage space, and two upgraded handicapped accessible bathrooms. Amato explained that the ARC building was originally an old house now owned by the town, which rents it to ARC for $1 a year. The upstairs housed Catholic Family Services at one time, but now ARC uses the whole building and there’s still not enough room, she said. ARC is a human service agency that provides advocacy, education, information and referral, and an array of quality and individualized services and supports to people of all ages with intellectual disabilities, and their families. The agency operates seven licensed group homes in Southington, Cheshire, and Wallingford and provides services to individuals living in their own homes. It started in 1954 as a family-run support group and volunteer organization, which met in people’s basements. Amato said it then was housed in an old schoolhouse nearby, before moving to its current location. For more information, visit www.arcsouthington.org . Posted in New Britain Herald, General News, Southington Herald on Thursday, 1 November 2018 18:06. Updated: Thursday, 1 November 2018 18:09.